Way back at Christmas 2013 I won a craft basket mostly full of knitting needles, crochet hooks & yarn; but hidden at the back there was also a pack of "Inky Shrinks". 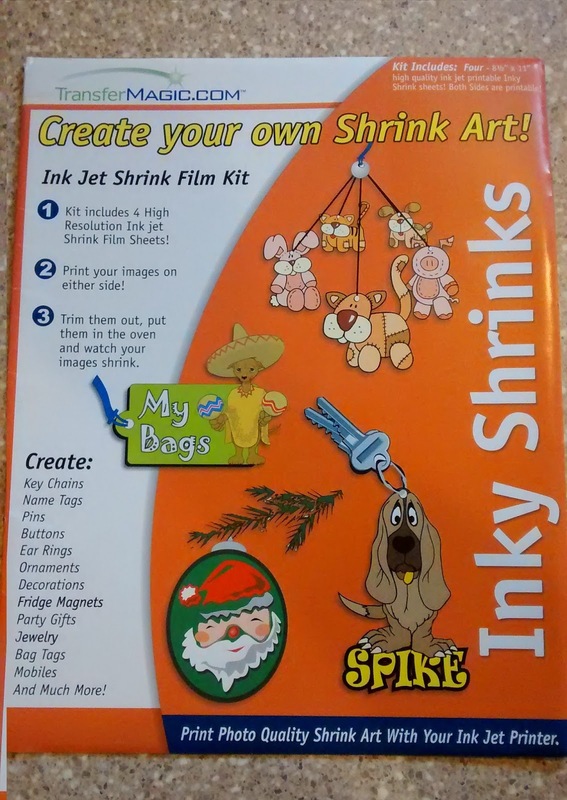 The Inky Shrinks pack contained four A4 sheets of white shrink film which is specifically designed to work with an ink jet printer and then get heated & shrunk in the oven - just like shrinky dinks. I thought it looked exciting, but at the time I didn't have a printer and I was too keen to get into all the luscious yarn in the basket! And then I sort of forgot about it. It caught my eye again recently and I was trying to come up with something useful to do with it... 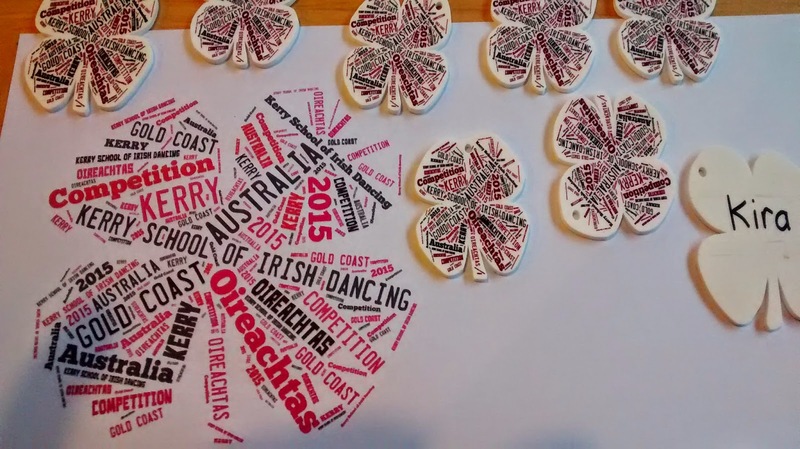 The little miss is going on a dancing trip to Australia for the Australian International Oireachtas in May and I thought we could make some sort of keepsake for all of the kids and teachers going. I thought the Inky Shrinks pages could be perfect to mass produce something - especially since I could use my computer to design something & print them all off exactly the same. I'm very crafty, but not a very good artist, so I turned to Tagxedo to help me create the perfect picture. 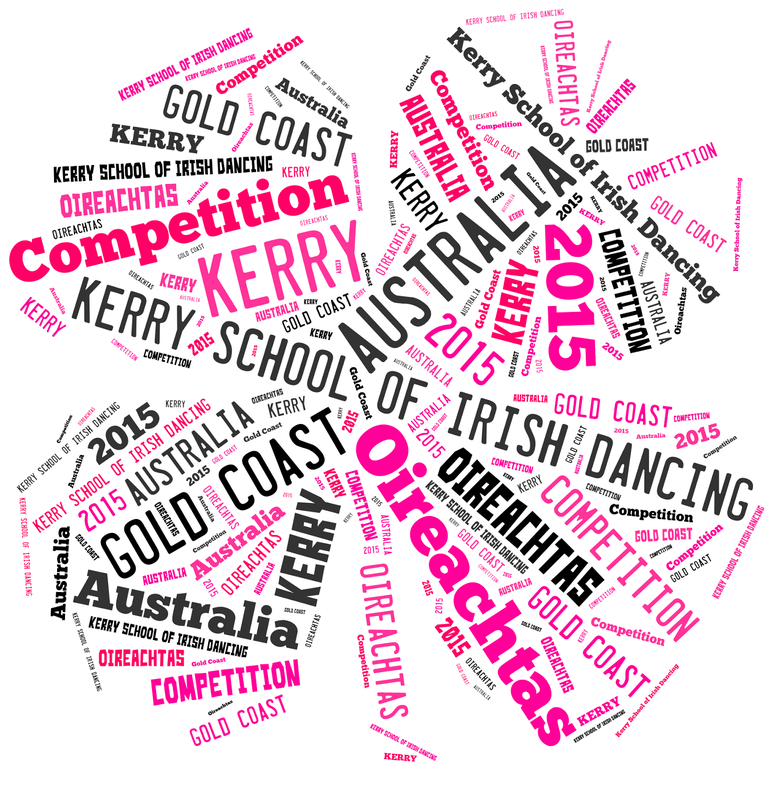 I entered words specific to the competition trip and formed them into a four leaf clover shape for luck. I did two versions: a white background with pink & black writing (the dancing school colours) and a black background with white & pink writing. I then printed them on an Inky Shrinks sheet, cut them out & punched a hole in them, and shrunk them in the oven. On paper I liked the black background best, but after they were shrunk the words almost disappeared completely into the black background. So we opted for the white. Before shrinking I personalized each one by writing their name on the back in sharpie. 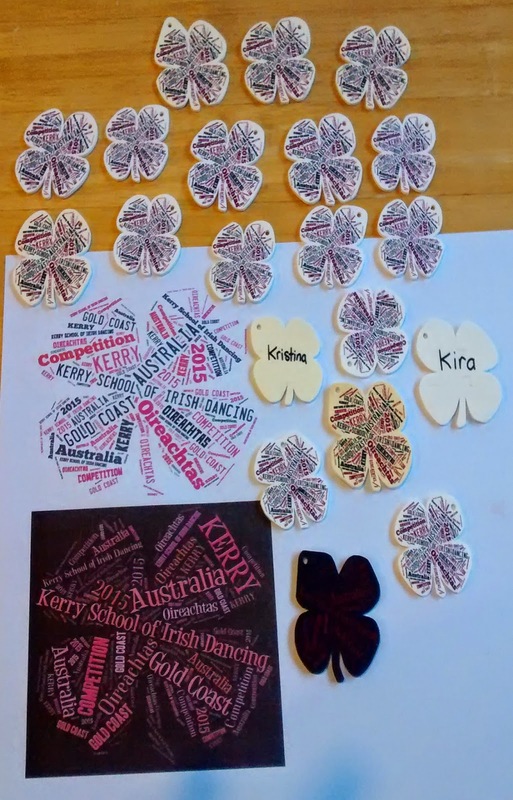 I'm really pleased with how they turned out and from the 4 sheets included in the pack I was able to make one for each of the 16 dancers and the two teachers making the trip across the ditch. 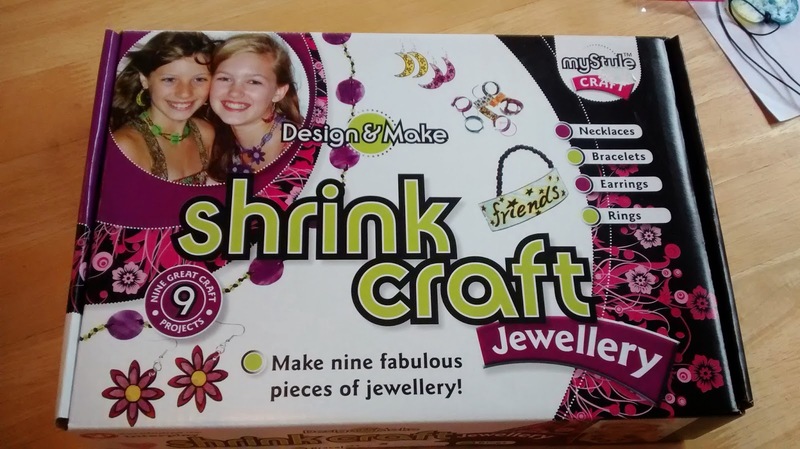 Co-incidentally I found a shrink craft jewellery kit when I was out shopping the other day and the little miss was so excited about it I had to buy it for her. The plastic shrink sheets included are like the old ones I remember from when I was a kid and they're alright, but difficult to get a nice sharp image and almost a bit brittle to cut out. The Inky Shrinks were much nicer to work with and produced sharper images and smoother edges. 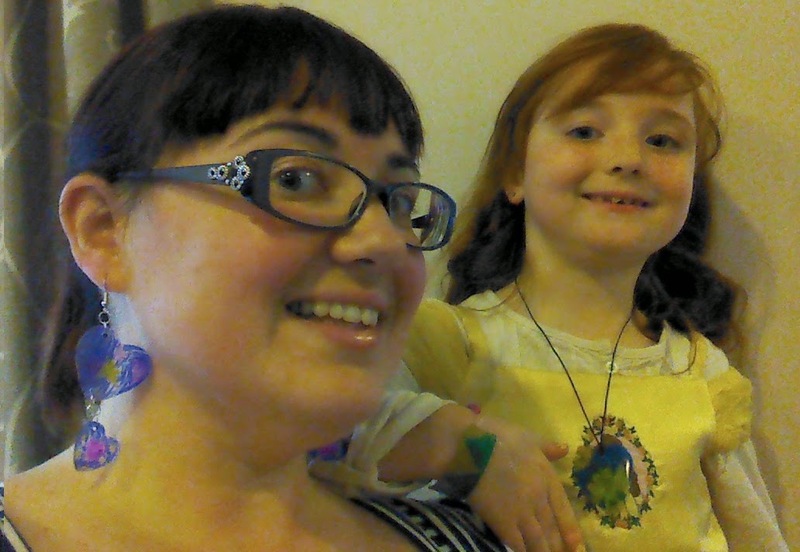 My new earrings made by the little miss. 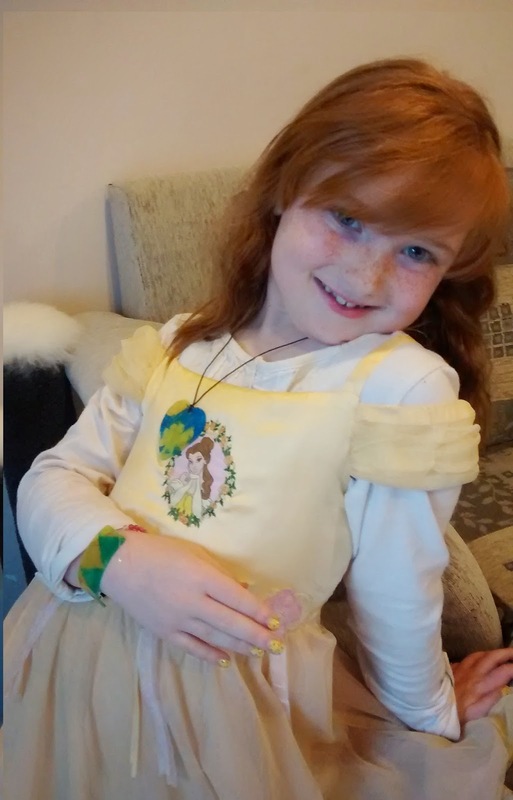 I have searched for Shrinky Inks for sale in New Zealand, but so far haven't had any luck (the shop I won the basket from no longer stocks them). I have, however, found a few other types of shrink film sheets that I will probably try out. 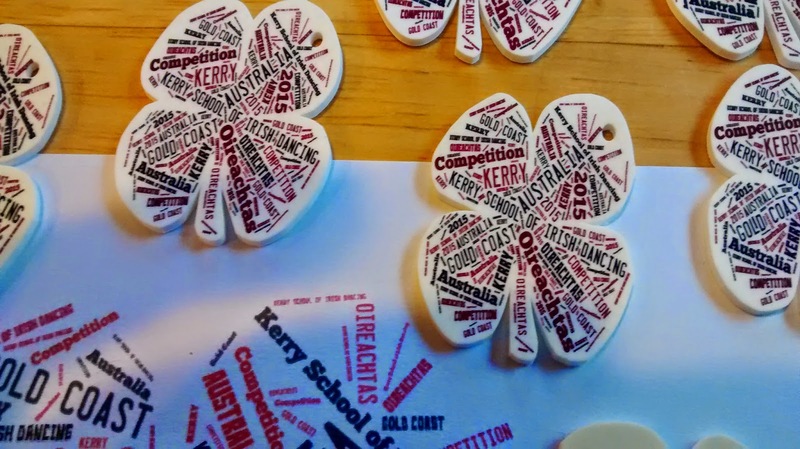 I thought they would be particularly good for making personalized Christmas ornaments this year.